Coroner Releases Causes Of Death For All 58 Victims Of Las Vegas Shooting : The Two-Way Nearly all of the fatalities were caused by a single gunshot wound, though six died from multiple wounds. The deaths were all ruled homicides. The 58 fatalities in October's mass shooting in Las Vegas were all caused by gunshot wounds, the county coroner and medical examiner said Thursday. 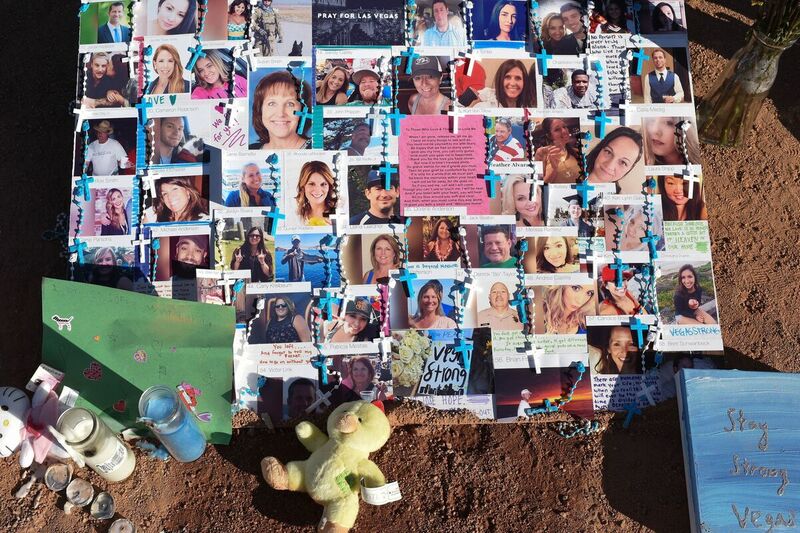 A makeshift memorial on the south end of the Las Vegas Strip a few days after the shooting has photos of some of those who were killed. All 58 of the people killed in the mass shooting in Las Vegas on Oct. 1 died of gunshot wounds, the Clark County County Office of the Coroner/Medical Examiner has determined. Nearly all of the fatalities were caused by a single gunshot wound, though six victims died from multiple wounds. Most had been shot in the head, chest or back. The deaths were all ruled homicides. In the chaos of the shooting, in which bullets rained down on a country music festival from a gunman on the 32nd floor of a nearby hotel, it wasn't immediately clear whether any victims might have died from trampling as the crowds sought to escape the fusillade. The shooter, Stephen Paddock, died from a gunshot wound to the head that entered through the mouth. His cause of death was a suicide, the coroner's office said. Coroner John Fudenberg told the Las Vegas Review-Journal that it has taken more than two months to release the information because his office wanted to be accurate and notify the victims' families first. "Because of the impact that this incident had on our community, and the attention that this incident received, it became very important for us to ensure that all of the families had the information prior to us releasing it to the public," Fudenberg told the newspaper. More than 500 people were injured during the shooting, and thousands of others who were there at the Route 91 Harvest Festival have been trying to cope in the months since the tragedy. One woman who was there, Melissa Barham, recently told NPR's Weekend Edition that since the massacre, she's been sad and depressed and wonders whether anything has really changed since the Sandy Hook shooting five years ago. "I wake up every morning and I journal," Barham said. "I pick one of the victims and I write down their name and their age and where they're from and then just details about them. And I just think about them." "And this time of year, the holidays, make it really hard."